Environmentalists have been warning about the problems associated with a class of pesticides known as neonicotinoids (neonics) on pollinators and other wildlife, but now there’s some good news that comes with a decision from the U.S. Fish and Wildlife Service (FWS) to phase out these toxic chemicals on wildlife refuges in the Northwest and Hawaii. Neonics can be used in sprays, but are often applied as a coating on agricultural seeds and when it is, it spreads throughout the plant as it grows making the whole thing poisonous to a variety of insects. Studies have shown that they can be lethal to honey bees, bumble bees and other species at high doses, but even a little bit can cause problems by making them more vulnerable to other stressors. They’ve also been linked to Colony Collapse Disorder and have recently been found to be harmful to aquatic invertebrates and birds. That’s not just bad news for pollinators, it’s bad news for us and the wild animals who depend on them to help pollinate crops and other wild plants we all depend on for food. Earlier this year environmental organizations petitioned the agency to ban both genetically engineered crops and neonics throughout the National Wildlife Refuge System over concerns about the dangers they pose to wildlife and protected species and because their use is inappropriate on land that’s supposed to be designated to protect wildlife and conserve habitats. In a memorandum published by the Center for Food Safety earlier this month, the FWS acknowledged that neonics could have adverse effects on a “broad-spectrum of non-target species” and agreed that their use does not meet the intent of policies that are supposed to cause the least harm to wildlife and their habitats. The agency also noted that they’re not only potentially being used on agricultural crops that are grown on wildlife refuges, but that they may be getting introduced through plants used in restoration projects. Kim Trust, the deputy regional director of the FWS, told the AP that the agency made the decision because it is concerned about the global decline in all pollinators. As of now, refuge managers will be required to take other steps to avoid their use on close to 9,000 acres of land in Hawaii, Idaho, Oregon and Washington and should have neonics completely phased out by January 2016. Spokane, Wash., is the latest city to pass an ordinance limiting the use of neonicotinoid pesticides. It’s happening very slowly, one midsize to large city at a time, but the Pacific Northwest is inching its way toward becoming a haven for honeybees. Earlier this week, Spokane, Wash., joined Eugene, Ore., and Seattle in passing citywide bans on neonicotinoids, a class of pesticide that’s widely believed to be harming the pollinators that play such an important role in our agriculture system—a full 33 percent of the crops grown worldwide depend on honeybees. The 5–2 city council vote (the dissenting votes came from two councilmembers who said the research wasn’t convincing enough) came just after Pollinator Week, amid a rush of bee-related news. 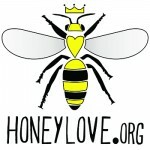 There was President Obama’s announcement of a Pollinator Health Task Force, a preview of a report that says neonics are worse for bees than DDT, and another study that showed that the supposedly bee-friendly plants you can purchase at major retail chains contain high levels of the pesticide. 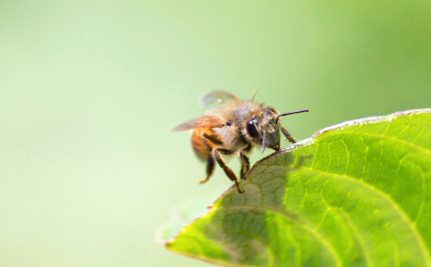 Eight years after the first instances of colony collapse disorder occurred, sparking increased interest in pollinator health among both scientists and environmentalists, it appears that new momentum is building behind efforts to protect bees. In Spokane, the new ordinance won’t cover all city-owned land, as the parks department manages a chunk of public property, but it has assured City Council President Ben Stuckart that neonics aren’t being used in Spokane’s parks. The ordinance mandates that “no department may knowingly purchase or use products or products in packaging containing neonicotinoids,” but it does not apply to personal use of the pesticide on private property. “This ordinance simply says Spokane prioritizes the protection of our food supply over the ornamental use of pesticides,” Stuckart said in a statement. Spokane may not have a vested economic interest in protecting honeybees, but Washington state certainly benefits from the estimated $15 billion in increased crop value the bees bring with their highly efficient pollination. The state is the country’s leading apple producer, and the 175,000-some acres of orchards that grow there depend on a healthy population of honeybees and other insects to yield a good crop. The federal Pollinator Health Task Force doesn’t promise any sweeping ban, but perhaps the local actions of cities like Spokane can help propel more measured reforms—ones that could bring limits on neonics and other chemicals that are harmful to bees—out of the city and onto farms. by: CHRISTOPHER ONSTOTT – Beekeeper Damian Magista transfers a new hive of bees to the rooftop of the New Seasons Market in Happy Valley. The Portland grocery chain is educating customers about the vital role that bees play in the food chain. You’ve heard of eco-roofs and rooftop gardens, but the latest twist to hit Portland comes with a sweeter payout: rooftop honeybee hives. New Seasons Market recently installed a honeybee hive atop its store in Happy Valley, a picturesque suburb 15 minutes east of Clackamas that’s a mix of newer homes and farmland. In other words: Happy bees make lots of honey. By late August, Magista expects the bees to produce enough honey to start selling it at the Happy Valley store. But that’s not the primary motivation for New Seasons’ “Bee Part of the Solution” campaign. 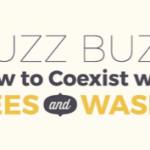 The company aims to educate people about the honeybee’s critical link in the ecosystem, and the fact that they are dying out worldwide, due to what’s known as Colony Collapse Disorder. The number of managed honeybee colonies in the U.S. has decreased from 5 million in the 1940s to 2.5 million today, according to the U.S. Department of Agriculture. A May 2 report by the U.S.D.A. and U.S. Environmental Protection Agency points to a variety of stressors, including parasites and disease, genetics, poor nutrition and pesticide exposure. Scientists at the Oregon State University Honey Bee Lab have been focusing on two factors in particular. They’re studying the impact of a honeybee pest called the invasive varroa mite, as well as poisoning by pesticides applied to crops or to hives to control insects, mites and other pests. New Seasons sees it as part of its mission to educate people about the phenomenon, because of the direct link to the food chain. “There is an important link between the health of American agriculture and the health of our honeybees for our country’s long-term agricultural productivity,” said Agriculture Deputy Secretary Kathleen Merrigan, upon the release of the latest federal report. New Seasons could install a second rooftop hive at its Sellwood store in Southeast Portland in June after a process required by Multnomah County to notify neighbors. The initial hope was to install honeybee hives on all 12 of the local grocery chain’s rooftops (a 13th location opens late August in Northeast Portland’s Eliot neighborhood). But Washington County won’t allow it, so the Progress Ridge store in Beaverton may miss out. 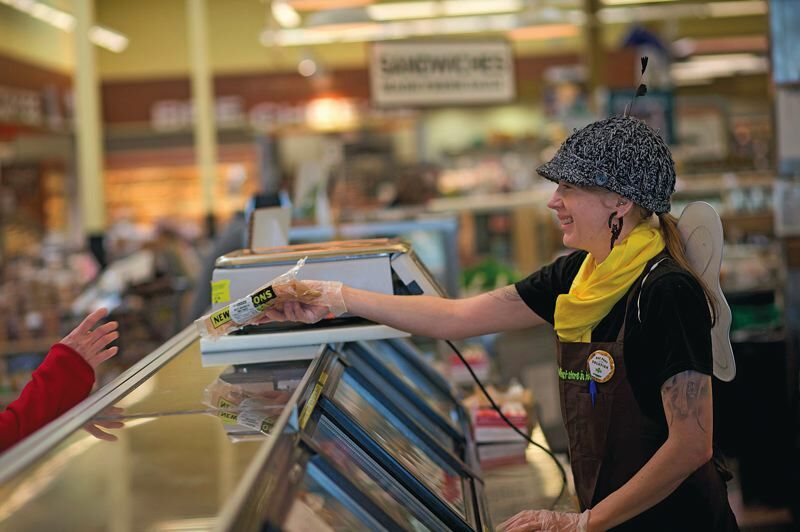 by: PAMPLIN MEDIA GROUP: CHRISTOPHER ONSTOTT – Katie Passero dresses as a bee to work the counter at New Seasons Market, as part of the companys Bee Part of the Solution campaign. The rooftop hive idea was sparked by an incident last summer, when a swarm of bees made its home above the New Seasons sign at its Raleigh Hills store in Southwest Portland. Local TV cameras came and documented the removal of the swarm, which was safely relocated. A few other grocery store chains have begun rooftop hive projects, including Bi-Rite in San Francisco, which New Seasons used as a model, says Mark Feuerborn, the Happy Valley store manager. Feuerborn, a home beekeeper who’ll manage his store’s hives, is excited for what’s to come. 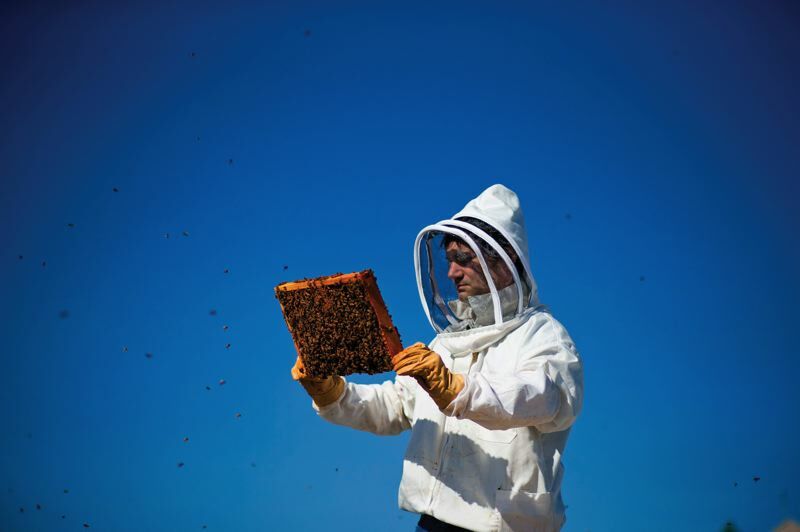 A “bee cam” will let people peek in on the hives and the honey harvesting. Shoppers can draw a direct link to the products in the store through new displays of honey-based products — everything from lip balm and candles to jars of pure, unprocessed honey made in Portland. 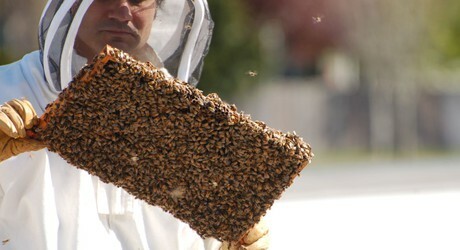 Interest in urban beekeeping has soared in recent years. There’s a Portland Metro Beekeepers’ Association, whose members keep bees for hobby and business. The Portland-based Xerces Society, a nonprofit invertebrate conservation group, launched a “Bring back the pollinators” campaign. That’s attracted more than 1,000 people who signed a pledge to do four things: grow a variety of bee-friendly flowers that bloom from spring through fall; protect and provide bee nests and caterpillar host plants; avoid using pesticides, especially insecticides; and talk to neighbors about the importance of pollinators and their habitat. There’s also a Portland Urban Beekeepers group, which aims to promote the public’s awareness of “apiculture” and the overall health and diversity of bees in the Pacific Northwest. Club president Tim Wessels says his group started with a dozen or so people meeting informally in 2010. Last spring they’d grown so large that they created officer positions and began meeting monthly. Today there are 115 members who pay the $15 annual dues, plus another 240 members on Facebook. Others just like honey, and he’s cool with that, too. Wessels and fellow beekeeper/business partner Glen Andresen are working with a grad student at OSU’s Honey Bee Lab and retired entomologist Dewey Caron on an effort to breed a local queen bee. Most of the purchased queens here come from Southern California or Kona, Hawaii, Wessels says. Unsurprisingly, they’re not able to survive Oregon’s winters. Wessels believes it’s possible to breed a Portland honeybee with “hygienic behavior,” which is their behavioral mechanism of disease resistance. After the queen lays an egg in a cell, if a worker bee somehow determines mites are in the cell, it would remove the mite. The result is that the mites aren’t able to reproduce. It might sound like a far-fetched idea, but Wessels and his team have about 100 hives around Portland, and they’re collecting swarms that did survive this past winter. “If we are successful in developing a more locally adapted honey bee, perhaps others can use this model in other cities,” he says. Magista, the beekeeper working with New Seasons, owns a startup company called Bee Local, which harvests and sells micro-batches of artisan honey varieties — with flavors made distinct by the flora and fauna of each neighborhood. He works with backyard beekeepers in the Mt. Tabor, Laurelhurst, Powellhurst and Brooklyn neighborhoods, and the buzz is spreading. Beekeepers estimate there are about 500 hives being kept by people in Portland, many on rooftops, since bees are attracted to trees at about the 15-to-20-foot height. One of those rooftops is at Noble Rot restaurant in Portland, and more could soon follow. That’s good news for honey connoisseurs. “What dictates the taste is the flowers and forage in that particular area,” says Magista, who won a 2013 “Local Food Hero” award in March, presented by Ecotrust.